In conjunction with Pittsfield Healthy Partners I am creating a Labyrinth event for Pittsfield's Third Thursday on October 15th. The labyrinth is a single circuitous path that winds its way into the center. You will be able to slow down, relax and let go of the pressure and stress from your week and life. When you reach the center there will be a message just for you to help you go forward, be energized and renewed. The path is in full view, and will be lit by candles which allows you stay quiet and focused. 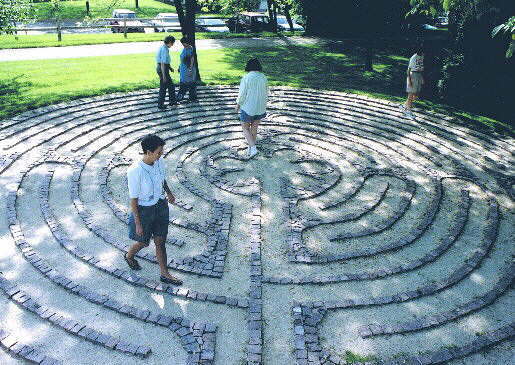 Use the labyrinth in any way that meets what you need while being respectful of others walking. To prepare, you may want to sit quietly to reflect before walking the labyrinth. Some people come with questions, others just to slow down and take time out from a busy life. Some come during times of grief and loss. Some come to find strength to take the next step. It will be located on the lawn outside St Joseph's Church on North St. The plan is to make the labyrinth from twine and pegs, lined with tea lights. The labyrinth will go to an indoor venue if weather is bad (location to be decided).